Interactively browse, view and edit Schematic Library components and their pins. The SCH Library panel enables you to browse through, and make changes to, the components stored in the active schematic library document. The panel also offers the ability to pass on any changes made to components in the library directly to the current schematic design document. The SCH Library panel will automatically open when a Schematic library is the made active document in the editor. Otherwise, when a SCH Library is the active document in the editor, the SCH Library panel can be accessed from the menu's View | Schematic | button. Panels can be configured to be floating in the editor space or docked to sides of the screen. If the SCH Library panel is currently in the group of docked Workspace panels on the left, use the SCH Library tab located at the bottom of the panels to bring it to the front. The SCH Library panel becomes available when the component Symbol Editor is active, which is in turn instigated by adding or editing a symbol from CircuitMaker's Component Editor. Components – The list of the active components, which is a single entry for a vault component, in the active library document with the associated description. Pins – A list of all the pins that have been placed and defined for the current component. As you click on the component entry in the Components list, it will become the active part in the design editor window. Selecting a Pin object in the panel causes the corresponding graphical object to be highlighted (and zoomed) in the editor workspace. In this way the SCH Library panel offers a fast and easy way to browse, view and access the SCH library component and its pins. See the Notes area below for workspace editing hints. Use the tools available on the Home menu to create and edit the Library Schematic symbol and its pin configurations. To pass on changes made to the current library component to all open schematic design documents, right click the component entry and select Update Schematic Sheets. All instances of the changed component that exist on the design documents will be updated. As the component is selected in the SCH Library panel Components list, its symbol is centrally displayed in the main editor workspace and its defined pins populate the panel's Pins list. 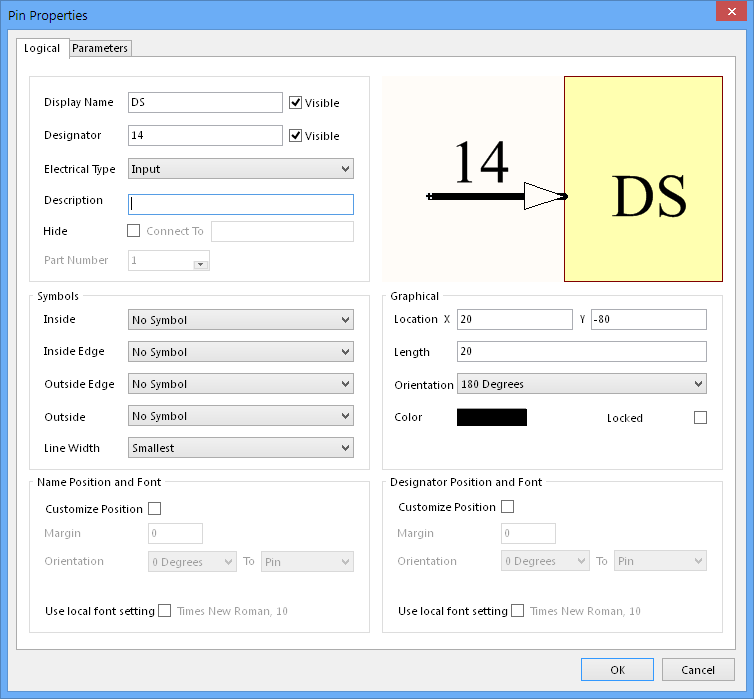 To display or edit the component properties, double-click on the component entry or click the button to open the Schematic Symbol Properties dialog. The primary Schematic properties are passed to the component instance that is placed in a Schematic document. 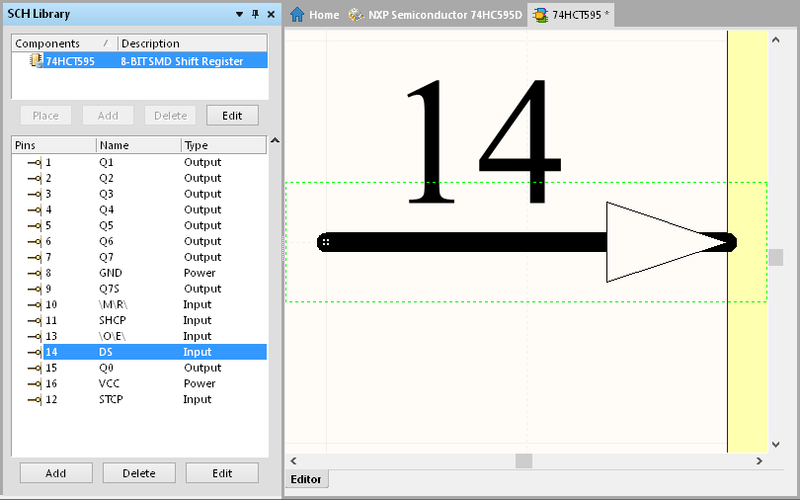 Along with the ability to edit the component properties and parameters, the Schematic Symbol Properties dialog also provides access to a grid style pin editor via the button. Pin entries in the Component Pin Editor dialog can be edited, added and removed, and configured to control the display of pin itself (Show) or its Number and Name strings. The grid style Component Pin Editor is a fast way to make changes to the component's pin configuration. Use the panel Pins list (below) for a more visual approach to pin editing. The Pin List section of the panel lists all of the pins that have been placed and defined for the current component. Each entry in the list contains the pin number, the name that has been defined for the pin, and its electrical type. As you click on an entry in the list, the corresponding pin graphic will be centrally zoomed and selected in the design editor window. Double-clicking on a pin entry in the list, or selecting the entry and clicking the button below the list, will open the Pin Properties dialog, from where you can view/modify the properties of the pin as required. To add a new pin from the panel, click the button beneath the Pins list. The pin will appear floating on the cursor within the design editor window. Position the pin as required and click to effect placement. Continue placing additional pins or right-click or press ESC to exit pin placement mode. To delete one or more pins, select the required entries in the list and press the button. The pins will be removed from the list and deleted from the symbol's graphic. To Select, Deselect, Cut, Copy and Paste component objects in the editor workspace, use the associated command buttons in the Clipboard area of the main menu – Home | Clipboard. Options for the library workspace can be configured in the Library Editor Workspace dialog – Home | Library » Options. Ctrl+click over a selected entry in a list to deselect it. The keyboard shortcuts Up Arrow, Home, End and Down Arrow, can be used to display the previous, first, last and next entry in a list region, respectively. Multi-part components appear in the list with a + symbol (expandable) next to them. Each part is listed as a sub-entry below. Use the Parts command buttons in the Tools area to Add and Remove parts – Tools | Parts. Data may be sorted by any column by clicking on the header for that column. Clicking once will sort in ascending order. Click again to sort by descending order. The component that you paste into the active library document can originate from either a schematic design document or another schematic library document. A schematic design document must be open in order to pass on changes made to components in the library document. For a multi-part component, the corresponding pins for the active part will be highlighted with a white background in the Pin List section of the panel. All pins of other parts will be lowlighted with a grey background. You are, however, still able to edit the pins of these non-active parts. As you select pins in the design editor window, the corresponding pin entries will be selected in the panel. The attributes of pins and other graphical objects used to define the component can be edited using the SCHLIB Inspector panel. 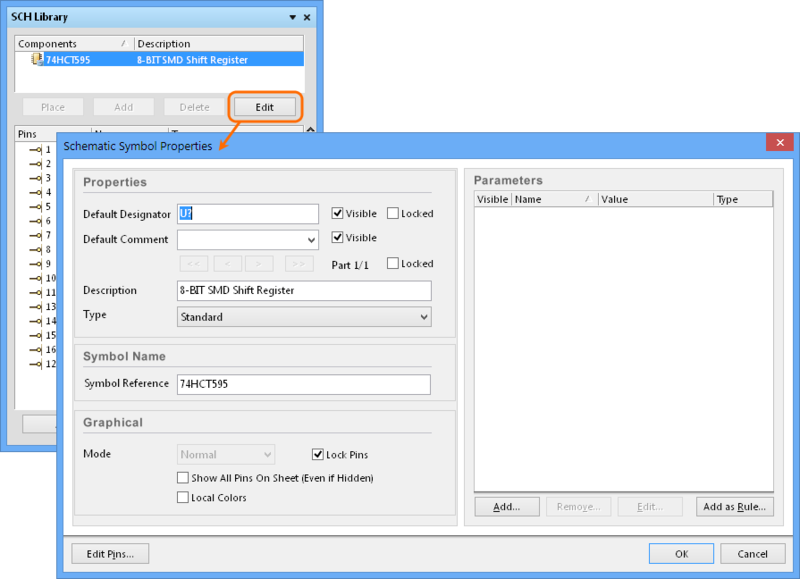 Objects must be selected first in order for the panel to display the attributes.